Welcome to the Wisp particle physics Monte Carlo software. Wisp is capable of simulating protons, neutrons, electrons and photons and can determine trajectories, mean free paths and dose deposited in almost any element from the periodic table. At its core, Wisp is a (very) simple Geant4 Graphical User Interface. Best of all, Wisp is completely free. Here you can download Wisp for Windows, find a description of the GUIs basic capabilities and a basic user manual. Wisp is a very simple Graphical User Interface (GUI) that will allow you to use some of Geant4's awesome simulation capabilities straight out of the box, no programming, no compiling, just run the installer and become productive straight away. Read more. Wisp can be downloaded from the Downloads Area. The software itself is not large (a few tens of mb) but if you do not already have Geant4 installed, you may need to install the Geant4 datafiles as well. The Wisp user interface is designed to be as intuitive as possible. For detailed instructions and information about the underlying simulation methods, a short User Manual is available. A Wisp simulation is set up by picking a particle (proton, neutron or electron) and picking a target material from the periodic table. Then a run mode is selected to determine what should be simulated. 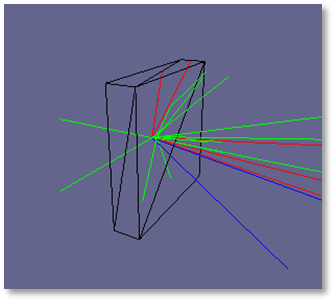 Wisp can either try and determine the mean free path of the particle as a function of energy, use the Geant4 EM-calculator to determine the continuous energy loss of the particle as a function of distance travelled in the target material, or perform a full simulation in which the chosen particle is incident on a target of finite thickness. When running in Full-Simulation-Mode, all steps of the particle and any secondary particles produced during the simulation are recorded to a text file as well as being plotted using the Irrlicht renderer. Protons incident on Lithium.10 GeV Protons incident on a 10cm x 10cm x 2cm Li target.